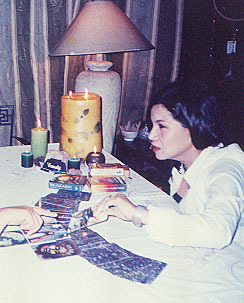 This article traces the history and genesis of the use of the SoulCards in the Philippines through the Healing-Quest project. I will share the lives of real people who have been touched by their gentle and loving wisdom. During the last decades of the century people from all walks of life and different cultural backgrounds have witnessed the ‘rebirthing’ of an age-old mystic tradition of the healing process. My second near-death experience in 1998 was a significant turning point in my life. I realized that I had a great responsibility to share the message of a very beautiful world and a loving light waiting for us all. I knew I would have to find the courage to launch the Healing-Quest, an alternative, non-traditional counseling project. The Healing-Quest was envisioned to be a meditative activity and a ‘prayer in motion’ that people can turn to when traditional modes of therapy have failed to meet their needs. I felt that seekers must be given the chance to be active co-creators of their own destiny and their stories should be listened to and heard. I was searching for inspirational and healing instruments that would give the project an authentic person-centered environment that is interactive, non-judgmental and compassionate. In the year 2000, I came across the SoulCards. As with any divinatory system and psychological instrument, the rule of thumb is to try it first on oneself before trying it on others. I played with the cards and assessed their ‘energies’ to see if they were friendly with me. I concentrated on present issues or concerns. I got the cards that ‘seemingly’ answered my questions. I repeated the process until I exhausted all possible uses for them. I knew I had found a “new friend”. My union with the SoulCards had begun. Since then, my SoulCards have become a main stay in all the counseling and journeys that I do with the ‘friends’ of the project since I introduced them in 2000. Through the SoulCards, the clients are encouraged to reflect and ‘retell’ the stories of their lives and to share their inner dialogues with me. I basically act as a facilitator, a ‘mirror’, a concerned and loving friend that listens to them and helps them refocus and re-evaluate their issues. Even religious people resonate to the cards. I can honestly say that the Soul Cards are very effective tools in counseling to gain access to the human psyche and reach the seat of universal/cosmic archetypes. Greg is in his early fifties. He is an intellectual, idealist and a very progressive thinker. During the turbulent years of Martial Rule in the country, he had been very active in the ‘reform movements’ to topple the dictatorship to restore the people’s rights and a government that is ruled by the majority. After the peaceful overthrow of the dictatorship, the new government invited the ‘progressive thinkers and idealists’ (i.e. activists and leftists) to help rebuild the nation. Greg heeded the call and is presently working as a community and peoples organizer. Greg came for consultation when certain issues in his past had started to ‘haunt’ him. The memory of his past failed marriage was blocking his capability to appreciate a new relationship that had come into his life. His effectiveness in work and decision-making abilities were highly affected by his problem. When Greg requested counseling, I could clearly feel that he was not living fully in the present. During the early phases of the counseling, he had the tendency to intellectualize and philosophize everything. I assured him it was all right to show his deepest emotions and I was not there to judge him. This made him feel better. I knew the inspirational tools I had used must have ‘struck a chord’ in his heart – He was becoming more human – a real feeling person. In the final stage of the counseling, I invited him to play with the SoulCards. He was very stunned to see the issues in the earlier sessions come out and how the cards had the ability to speak to his heart in a very profound way. He found the SoulCards gestalt and surreal and yet very inspiring. The SoulCards made him see his fears from a more positive vantage point. He learned to forgive himself for his shortcomings in his previous marriage and began to see the new relationship as a ‘gift and an offering’ of a new life. He made a strong resolve to move on and to make his existence really meaningful this time around. The SoulCards acted as clincher in his long search. Presently, Greg is busy with the on-going projects in the community. He is a staunch supporter of children’s rights. He is also enjoying his new relationship and looks forward for a better future. Actually, from being a skeptic about the use of spiritual and transcendental tools in the healing process; he has turned into a real believer and an active advocate of the project. He has also turned out to be a ‘real fan’ of the SoulCards. The Life of “Mariel”: Death of a Parent and SoulCards . . .
Mariel was in her late twenties when she came for counseling. She was emotionally upset and depressed due to the demands of her work and responsibilities in her family. She was suffering from low self-esteem and was searching for love and acceptance. After using the other healing tools with Mariel, she realized that in order to grow as a person, she must take an active role in her transformation. She saw the need to re-conceptualize her outlook in life. 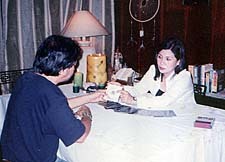 Mariel derived a lot of benefits from the SoulCards because they were her ‘gateway’ into her subconscious. The symbols in the random selection of the SoulCards were hers and that was her story. By describing them, she could verbalize her inner most fears and hopes without value judgment from anyone. Learning to face her issues in life made her more tolerant of other people and above all, she became patient with her own growth too. She gained more confidence and acquired a more positive outlook. Just when she was able to ‘mend her broken wings’, one of Mariel’s parents died. She did her ‘loving walk’ with the project and the SoulCards again. Mariel and I performed a ‘prayer in motion’. We visited sacred places to reach the ‘sacred space’ within her in order for her to find the strength to heal herself. We used the SoulCards and read scriptures and inspirational passages in the places we visited. I advised her to honor her loss and to cry her heart out if need be. Before we parted ways after our ‘rituals and ceremonies’, we concluded with a SoulCard reading. 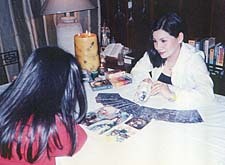 Judging from the card that she picked, I know deep in my heart that Mariel will find the strength to overcome her loss. Mariel left the country a few months after the death of her mom. She now has a new life and career in another country and she feels so blessed to have used the project and SoulCards in a very crucial time in her life. Peoples’ need for spiritual reawakening and rediscovery of their life purpose have been the catalyst for the creation of more gestalt and free flowing spiritual and divinatory tools. Seekers from all parts of the globe – from East to West have been guided by the wisdom of these wonderful instruments that have acted as ‘guideposts’ for the integration of the psyche and the soul in its journey to wholeness. Through the experience of the Healing-Quest project, the SoulCards has proven to be an effective tool for reawakening one’s intrinsic goodness and inspired them to recognize all that is good in their self and in others. Candi Magno is from the Philippines. She holds a Masters degree in Interdisciplinary Studies with majors in Sociology/Psychology and Literature.